Here is a fun FREEBIE for you to play with your little ones. 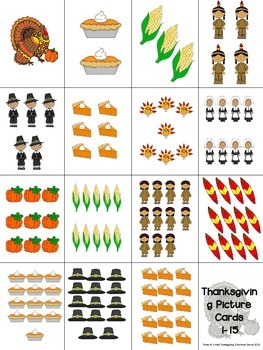 There are 15 cards with numerals 1-15, 15 cards with Thanksgiving pictures and 15 cards with feather tally marks. 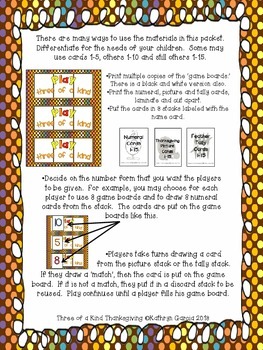 Also there are 2 pages with games boards (3 each in color and black and white). 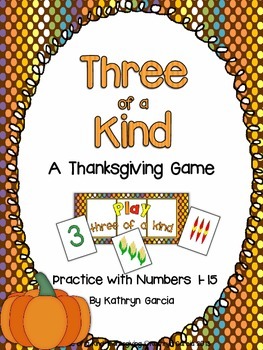 The players need to find three cards that match in number to make a 3 of a kind set. You can differentiate with the number of game boards and cards each student gets in order to fit your needs. There is a free Halloween Three of a Kind game here if you haven't snagged that yet!